This colorful stake features a wagon wheel covered with bright flowers and songbirds. 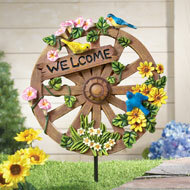 The dimensional wagon wheel can be placed anywhere in your yard or garden to welcome guests to your home. Resin wheel and iron stake. 11 1/4"L x 17 1/2"H.
Hang this set of two bright and colorful butterflies in the corners of a doorway or window to add a charming touch to any room in your home. 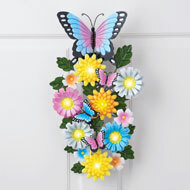 The beautiful butterflies flutter on scrolling metal bases that are accented with pretty flowers and green leaves. Each of the corner brackets has holes on the top and bottom for easy hanging. Metal. Each is 10 1/2"Sq. Set of 2. 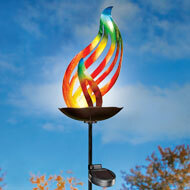 A colorful and bright focal point in your garden, this swirling metal flame features beautiful colors during the day and automatically shines with solarpowered light at night. The flame sits atop a black stake that is over 2ft. tall to rise above the plants and flowers. Includes 1 "AAA" rechargeable battery. Metal. Flame is 6"Dia. x 10"H, total height is 37 3/4"H.
Add these bright and cheerful cardinals to a wall in your holiday home for a colorful addition to your winter decorations. The set includes two cardinals with glass bodies and metal heads, wings and tails. Delightful holly leaves with sparkling red crystal accents are the finishing touch. Iron and glass. Hooks on back for easy hanging. Approx. 10 3/4"L x 9"H.
Decorate your mailbox with this beautiful, solarpowered swag. 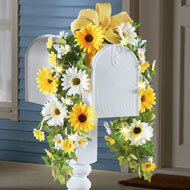 It features bright yellow and white daisies, plus greenery and a lovely yellow bow. Solarpowered lights automatically shine at night, while a "touch" closure secures it to your mailbox. Includes 1 "AA" rechargeable battery. Polyester and plastic; imported. Measures 38"L x 6"W x 6"H.
This set of charming butterfly sitters are delightful on a shelf, windowsill or anywhere throughout your home. 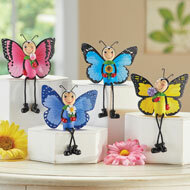 Each colorful butterfly is accented with a bright flower and has cute dangling legs. Handpainted with lots of adorable details. Resin and wire. Each approx. 4 1/2"L x 2"W x 5 1/2"H including legs. Set of 4. 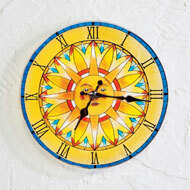 Brighten up any room in your home with this beautiful and unique clock that looks like stained glass. It features a lovely sun design with colorful shades of blue, yellow and orange. Hook on the back for easy hanging. Req. 1 "AA" battery (sold separately). Glass. 12"Dia. Add a bright splash of color to your home with this beautiful lighted wreath. 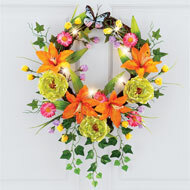 The wreath features orange lilies, pink daisies, wildflowers, roses, ivy and a colorful butterfly at the top. The 6 warm white LED batteryoperated lights add some sparkle and shine, while the hook on top makes hanging easy. Req. 3 "AAA" batteries (sold separately). Plastic, rattan and LED lights. 16"Dia. x 7" hanging ivy. 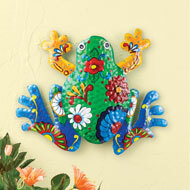 Bright colors and a beautiful design make this fun frog a unique addition to your décor, indoors and outside. The metal frog has bold patterns and a 3dimensional design. Hooks on back make hanging easy. Iron. 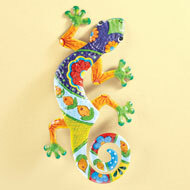 Measures 13 1/2"L x 11"H.
Bright colors and a beautiful design make this lizard a unique addition to your décor, indoors and outside. The metal lizard has bold colorful patterns of flowers and other artistic designs. Hooks on back make hanging easy. Iron. 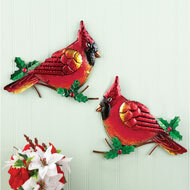 7 1/2"L x 15 1/2"H.
Add these bright and cheerful cardinals to a wall or fence for a colorful addition to your winter decorations. 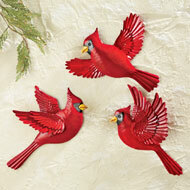 The set includes 3 handpainted cardinals in various stages of flight that feature intricate dimensional details. Iron. Approx. 11" x 8". 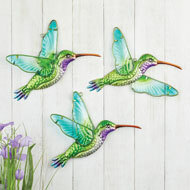 Add these bright and beautiful hummingbirds to a wall in your home or outside near the garden for a colorful addition to your seasonal décor. 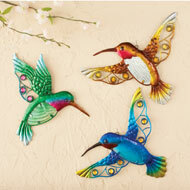 The set includes three handpainted hummingbirds with glass wings and metal bodies. Iron and glass. Hooks on back for easy hanging. Each is approx. 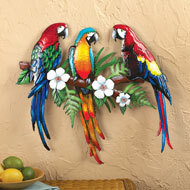 11"L x 10 1/2"H.
Add tropical color and style to your home with this trio of beautiful parrots. 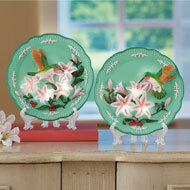 The three bright birds rest atop a branch that's accented with greenery and tropical flowers. Each bird is carefully handpainted with rich texture and gorgeous colors. Some assembly required. 22 3/4"W x 20 1/4"H.
These beautiful birds are a bright and colorful addition to your home. Great to display indoors or outside, the vibrant red cardinals are handpainted with realistic detailing and are featured atop tree branches. 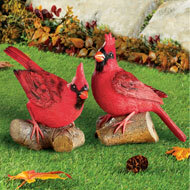 Choose the sitting cardinal, the perching cardinal or both for a lovely display. Resin. Approx. 7"L x 4"W x 7"H. Choose Perching or Sitting. 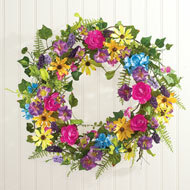 A colorful design with greenery and bright blooms make this wreath a lovely addition to your home. Hang it on your front door or inside for a lovely burst of color. 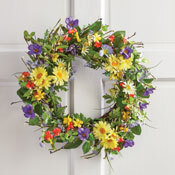 Wreath features bright yellow roses, vibrant wildflowers and greenery. Hook on back for hanging. Plastic, polyester and vine. 20"Dia. This colorful and festive wreath is a bold and bright way to showcase your patriotic pride. 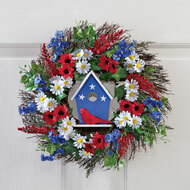 The beautiful wreath features blue violets, red and white daisies, greenery, red berries and a blue birdhouse in the center. Hook on back for easy hanging. Polyester, wood, plastic and vine. Measures 16"Dia. 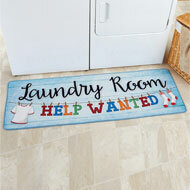 Brighten up your laundry room with this colorful mat! Wide enough to sit in front of both washer and dryer, this cute mat features a bright design of bubbles, a wash board, soap and other laundry day needs. The bottom reads "Soap and Suds & Dirty Duds". Spongefilled mat is soft on your feet. Hand wash. Polyester, PVC and polyurethane. Imported. 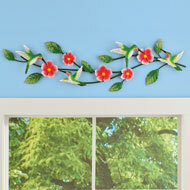 40 1/2"L x 20 1/4"W.
These beautifully blooming branches add color, texture and dimension to your home. Featuring bright pink flowers and flying Hummingbirds, this metal wall art is perfect above a door, window or anywhere in your home. Hardware on back for easy hanging. Iron. 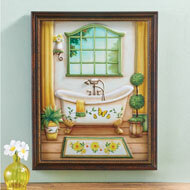 27"L x 8"H.
This 3dimensional wall art features a charming, oldfashioned bathroom with a claw foot tub, an ornate mirror and matching rug. 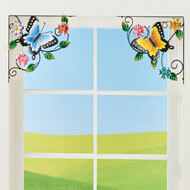 Each piece is decorated with yellow and white daisies and bright yellow butterflies. Hook on back for easy hanging. Plastic and glass. 12 1/4"L x 15 1/4"H.
Bright colors and lush greenery atop a lovely twig base make this wreath a wonderful addition to your home. 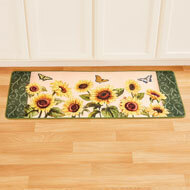 Features yellow daisies accented with orange and purple wildflowers surrounded by greenery. Hook on back for hanging. Iron, polyester, vine. Measures 19 1/2"Dia. The unique design of this solar lantern features a springstyle spiral that automatically shines with solarpowered light at night. 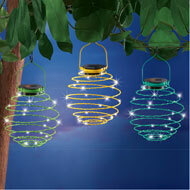 The lantern is available in green or yellow and includes 25 bright mini lights. A hook on the top makes hanging easy. Folds down for easy storage. Includes 1 "AAA" rechargeable battery. Iron. 6"Dia. x 9"H. Color available in Green, Yellow or Blue. 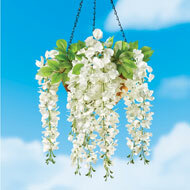 These beautifully cascading blossoms can be displayed indoors or outside for a stunning display. In a vase atop your mantel or hanging from a basket on your front porch, you'll love the bright splash of color these wisteria bushes bring to your home. 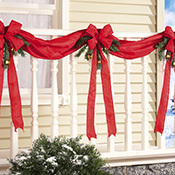 Set includes two white or pink bushes with greenery; pot and hanging chains not incl. Polyester. Approx. 10"L x 4"W x 25"H. Set of 2. Choose: Pink or White. 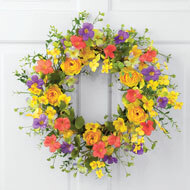 Add color and style to your home with this bright and festive wreath. 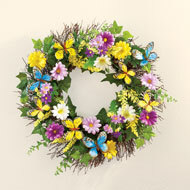 The beautiful wreath features colorful daisies, greenery and blue and yellow butterflies atop a vine base. A hook on the back makes hanging easy. Rattan, polyester and plastic. 18"Dia. 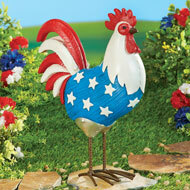 This charming rooster makes a festive addition to any patriotic or Americana decor. 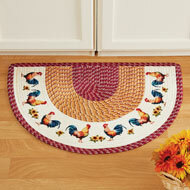 Displayed indoors or outside, the bright red, white and blue design makes this rooster a proud representation of your patriotism. Handpainted resin. 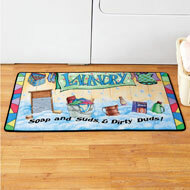 Measures 10"L x 4 1/2"W x 13"H.
Brighten up laundry day with this colorful laundry room runner. Wide enough to sit in front of both washer and dryer, it features a bright and cheerful design that's soft on your feet.  Skidresistant backing. Vacuum or spot clean. PVC, polyester and polyurethane; imported. Measures 57"L x 20 1/4"W.